I know, right? We’re going to get into the nitty gritty of everything you see here including links to everything which can be linked so grab a drink and settle down! The initial painting and main furniture changes were done in February, I like to settle in and live with things before I share them to make sure I’m giving you the whole picture rather than the shiny new version. 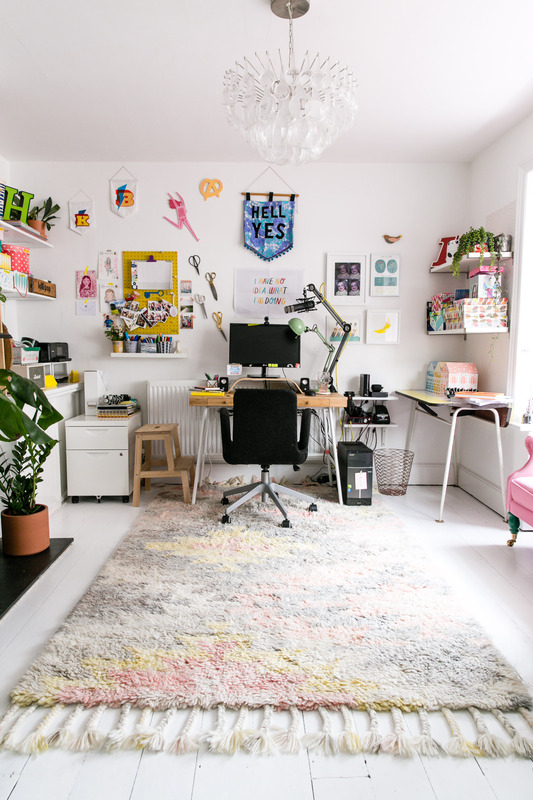 You know how much I love colour but working in a yellow room told me that I’d rather have a calm white base and add colour with everything in the room than work in a colour-covered space. So my decorator (hit me up if you need a Winchester decorator recommendation) Jake set to work painting over the yellow walls with Brilliant White. We lifted the carpet, which was laid for the babies as wooden floors are tough places to learn to crawl, and revealed the wooden floors underneath. Jake sanded back the varnish and used Ronseal Diamond Hard Paint which I have to say I was not impressed by. The rest of the ground floor was painted in V33 Renovation White Satin Wooden Floor & Stairs Paint, which although, two years on has marks, was far more durable than the Ronseal which had marks from the first month onwards. In future I would only use the V33 Renovation Paint – you live and learn. Ok, basics done, let’s go on a tour! 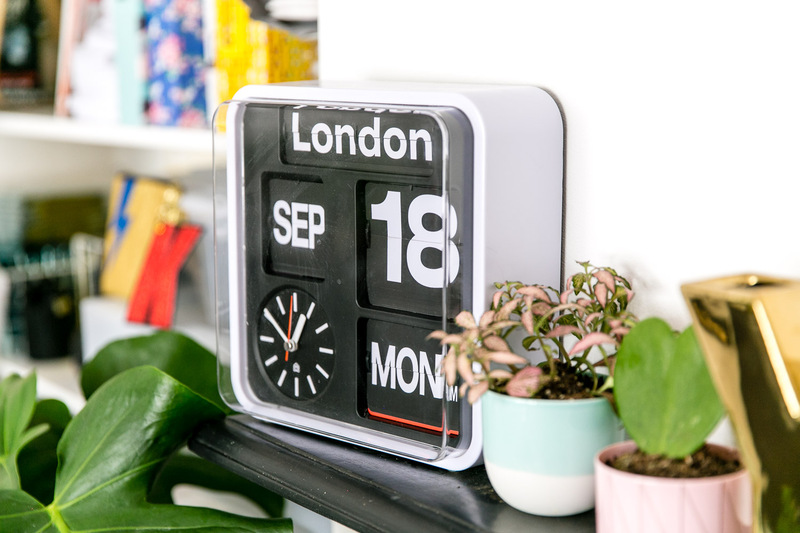 I have a video tour on my YouTube channel as well so you can have a proper nosey around – if you can’t see it here you’ll find it in the video (embedded further down the post). Let’s start with the desk, like many things in this room it came from IKEA. I wanted furniture which didn’t break the line of the floor and felt light in the space. I love the profile of this desk and the monitor stand (a step up from my German-English dictionary). Personally I’d like a super-size version of it as I find myself knocking things off the edge and into the bin too frequently although it does make me a tidier person. 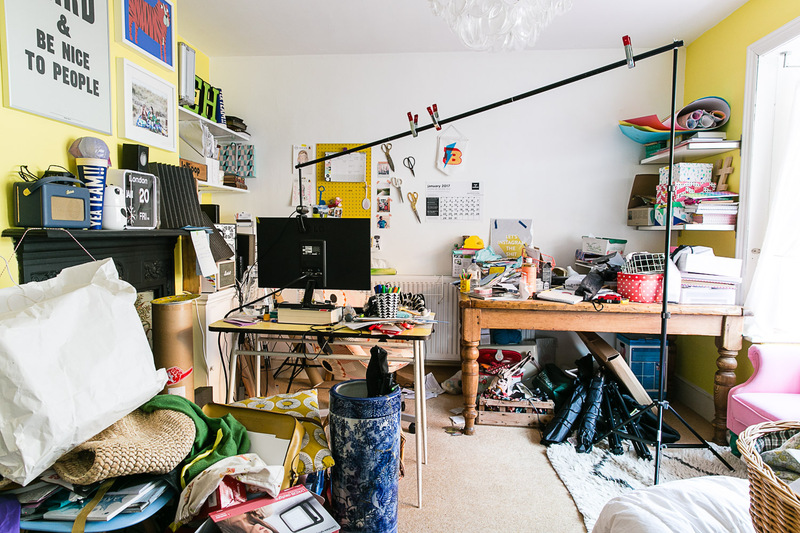 My old desk sits off to the right, sometimes used for storage and always ready to move about the room for shooting. It’s an old formica kitchen table with drop leaves so it doesn’t take up a huge amount of space. I have small shelves next to my desk to hold my label printer, hard drives, audio interface and often my lamp to make extra desk space. 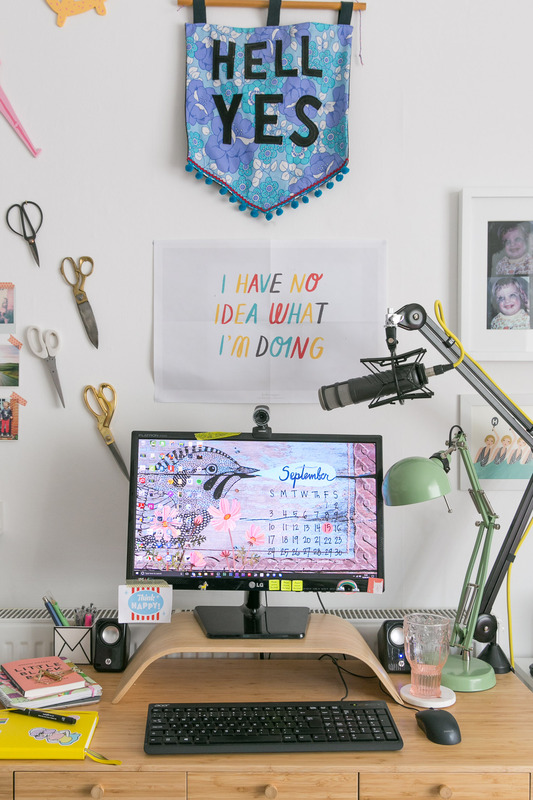 Over the desk I have my HELL YES banner which I made yonks ago and keeps me true to the mission – if it’s not a HELL YES then it’s a NO. Normally I have a planning calendar underneath it with all of my Blogtacular timelines on it. As I haven’t made one for 2018 yet, I have this pull out from Frankie Magazine by Sarah Abbott which makes me smile. The chair took me the longest to choose. I looked at *so* many and wasn’t any closer to finding the right one for me, everything was either ugly, uncomfortable or out of my budget, that is, until I went to work at IKEA for the day. I sat in this chair for hours and it was comfortable, simple in profile and easily within my budget. A year later I still love sitting in it so I would recommend it to you. 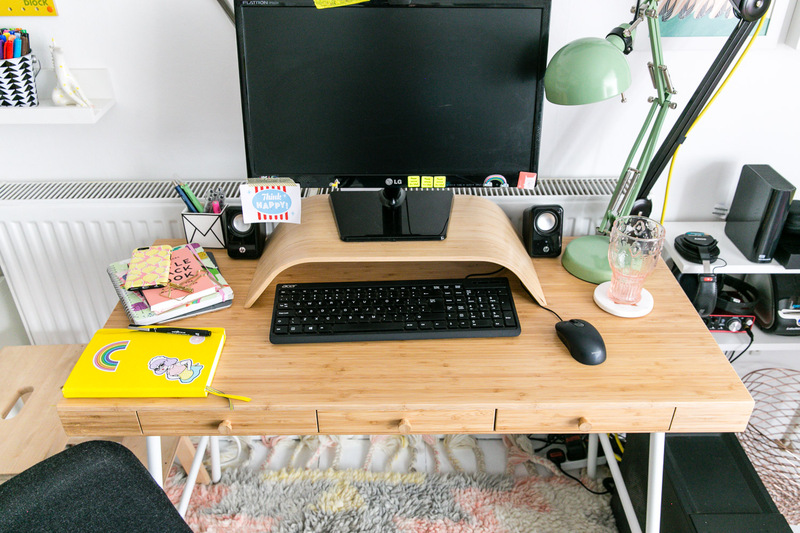 My desk sits at the far end of the room, having spent a year with clutter everywhere I looked it was important to make this part of the room as pleasing on the eye as possible. 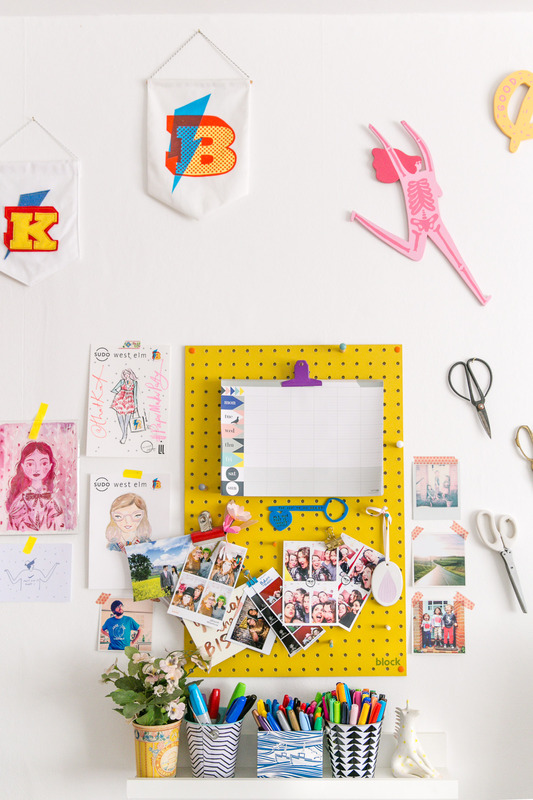 On the wall I have my pegboard where I pin momentoes and keep my Lollipop week planners. My banners and scissors sit alongside prints and photos which make me smile when I look at them. 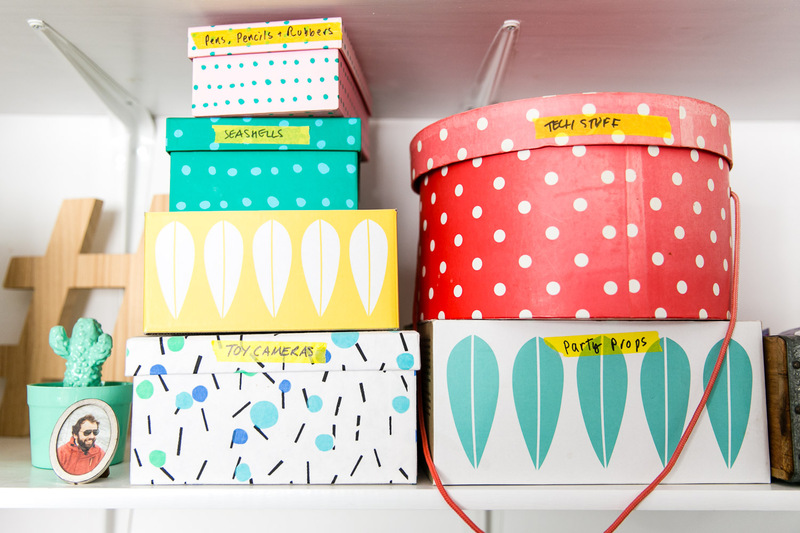 All the storage in this section is about stowing things out of sight. 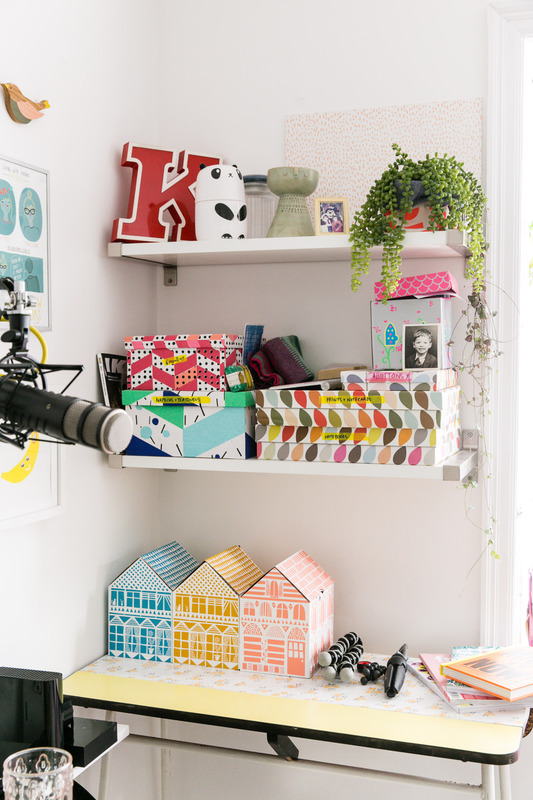 I love a colourful box and grouping things by category so all my shooting props are divided up and contained within my collection of boxes – one way to deal with my habit of holding onto pretty packaging! Also on the shelves you’ll find bits and bobs which make me happy, from my first cameras to random vintage items I’ve picked up over the years and old family photos. It’s where I bring together all of the me things which don’t really feel at home in the rest of the house. 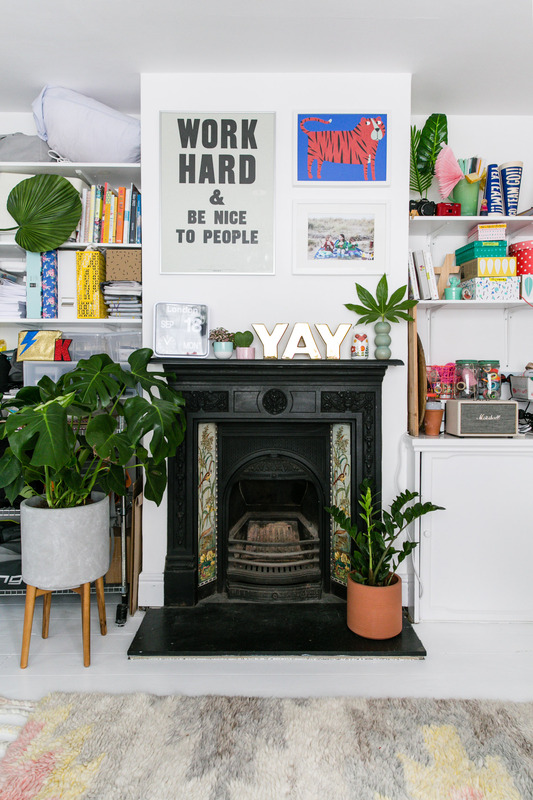 The built in cupboard beside the chimney breast hides a multitude of ugly camera accessories and items I only use once a year for Blogtacular (hello shelves filled with clipboards and balloons). It was here when we moved in and is one of the most useful pieces of storage in the house. Sitting on top of the cupboard I have all of my charging cables. I’ve fixed an IKEA extension lead to the wall (they have holes on the back to wall mount, nifty!) and used their shelf extenders to create a platform over the hot mess of cables. Even though the cables are chaotic under there I don’t really see them as my bluetooth speaker is in front and my excessive collection of tape and string is on top. Having all of my charging in one place is a big stress reducer as I know where to come looking for missing batteries or cables. The extension lead has an off switch so I can shut the whole thing down when not charging. In the corner sits my Canon Pixma printer and scanner. It’s bluetooth so I can print from my phone, laptop or desktop which is the most handy feature when printing endless school stuff as I can send it to print from whichever device I’m viewing the document on – seems tiny but makes all the difference. Also in this corner I have my filing cabinet so I can reach it from the desk. I chose a simple white design, I would love a version that was half as deep as it’s a bit big for my needs but I have soldiered on and filled the extra space with notebooks. So. Many. Notebooks. On top I have a gold in-tray which stores active notebooks and my pencil cases and a box file for everything waiting to be filed or binned. The fireplace is original to our home. It’s cast iron with hand-painted tiles featuring a marshy scene. I love it, it’s one of the charms of being in an Edwardian house, and it looks fabulous when you’re chilling on the sofa. It’s a working fire so if things get super chilly in the winter I can get light a fire and get toasty. As this is the backdrop to videos we film in here I keep the mantlepiece quite static, occasionally adding flowers to the YAY vases. The prints and photos on the chimney breast haven’t changed since the redecoration. I adore how they look and glancing them through the window as I come home. I know the Anthony Burrill is a little blogger cliche but I don’t even care, I love his work and the people who love it too so wouldn’t retire it just because it’s suddenly popular. To the left of the fireplace is the main storage in the room. We have wall mounted shelves with an IKEA kitchen shelf unit below. 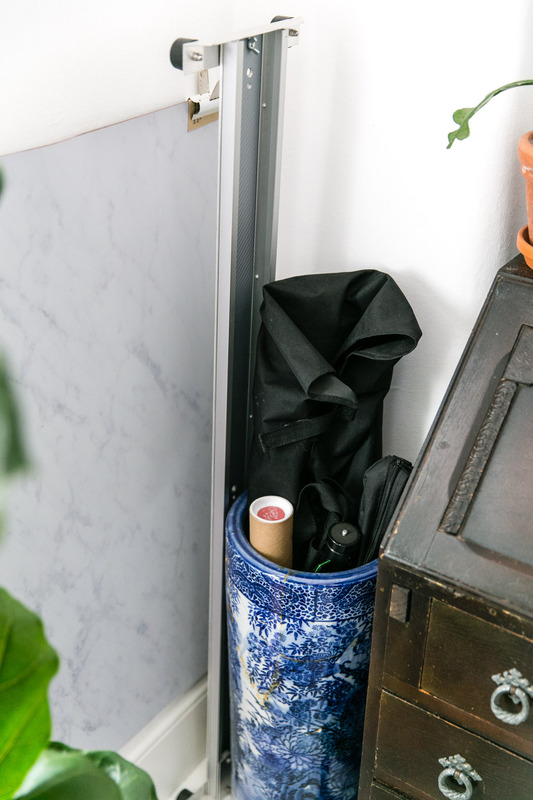 Here you’ll find my sewing machines, recording equipment, the shop, filing, large camera gear like lights and backdrops, all tucked away pretty neatly and mostly out of sight thanks to the door and my monstera who is currently living here. See those floor scratches? Completely unimpressed with this floor paint. I have since added casters. The bay window in this room is square which frames a small sofa perfectly. 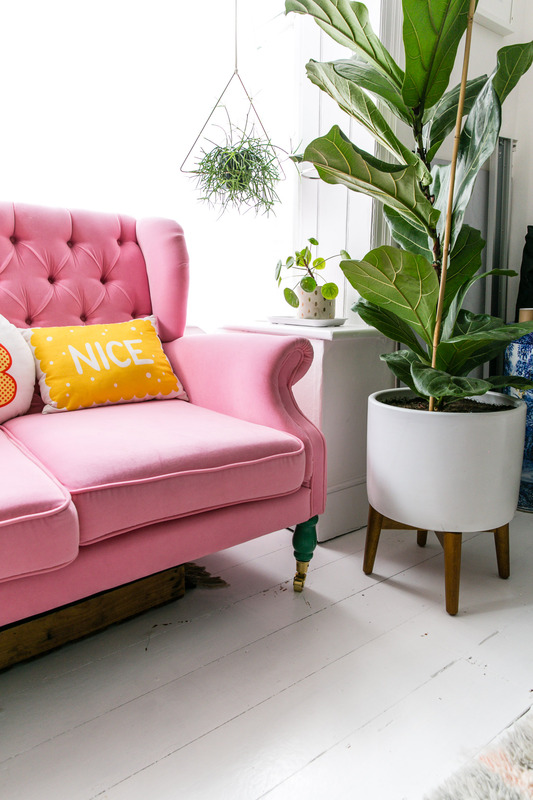 When I moved into this room my first purchase was this marvellous pink sofa by Rice.dk. It’s a perfect fit in the space and the design makes me think of the parlours of years gone by where you’d have your best furniture and only use it when the vicar came round. I like to sit here and read, think or pretend I’m not spying on my neighbours, it’s also a great spot for the children to sit and chat to me while I work. 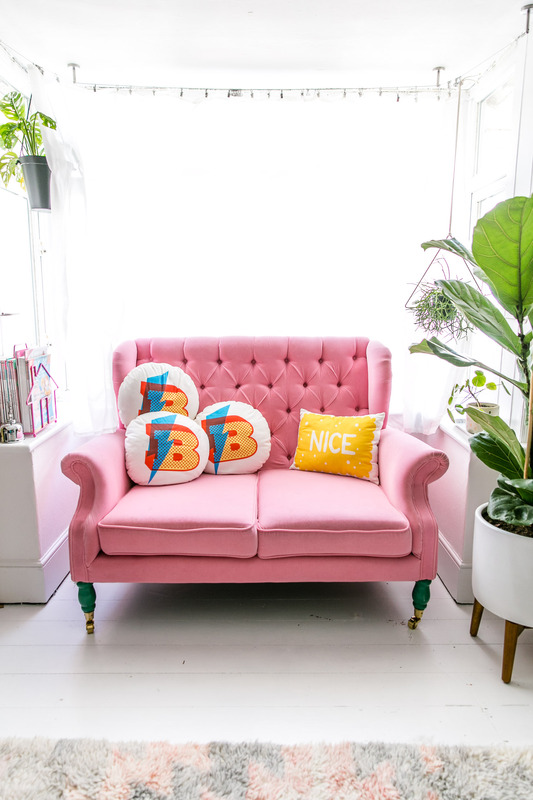 When people come to visit they say they didn’t need to look for the house number because they saw the pink sofa and knew it was my house – yes, this is the message a pink sofa should be sending! On the sofa the cushions are by Nikki McWilliams, the Blogtacular ones along with the banner she very kindly custom made just for me. 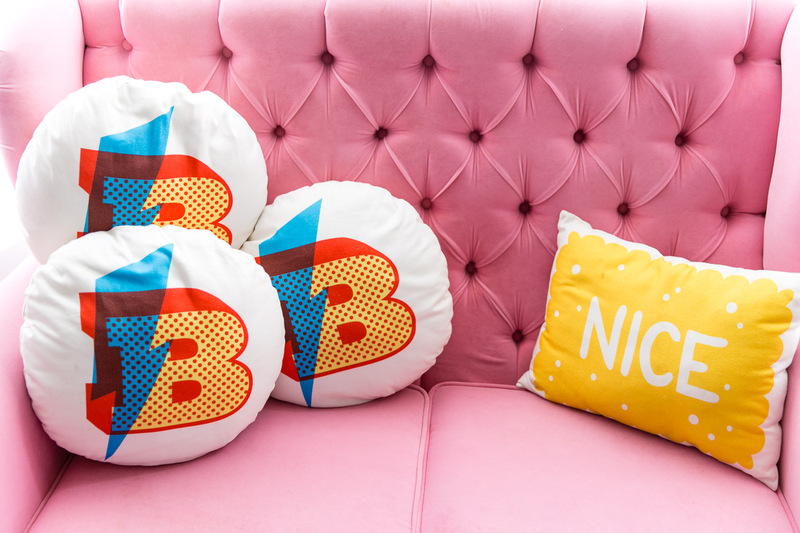 Not only are they comfy and perfectly sized for my diminutive couch but they make me feel like I’m properly in my HQ as branded soft furnishings are HQ standard. The house magazine rack is the exact shade of pink to match and holds an impressive twenty or so magazines which the girls periodically rifle through and make off with when I’m not looking. The room is North facing but gets wonderful reflected light thanks to my neighbours having white houses. At times it can be a bit too bright for filming or photography so I have a simple sheer curtain hanging from a wire curtain fixing. Most often, the curtain is tucked up over the wire and ready to flip down should I need it. Also on the wire I have some hanging plant pots. Having kept a handful of plants alive over the last couple of years I’m now bringing more green friends into the space and the couple hanging by the window make it feel less bare than it might without curtains. Possibly my favourite corner is to the right as you come through the door. Here you’ll find my Grandmother’s bureau which has been with us since our first home. 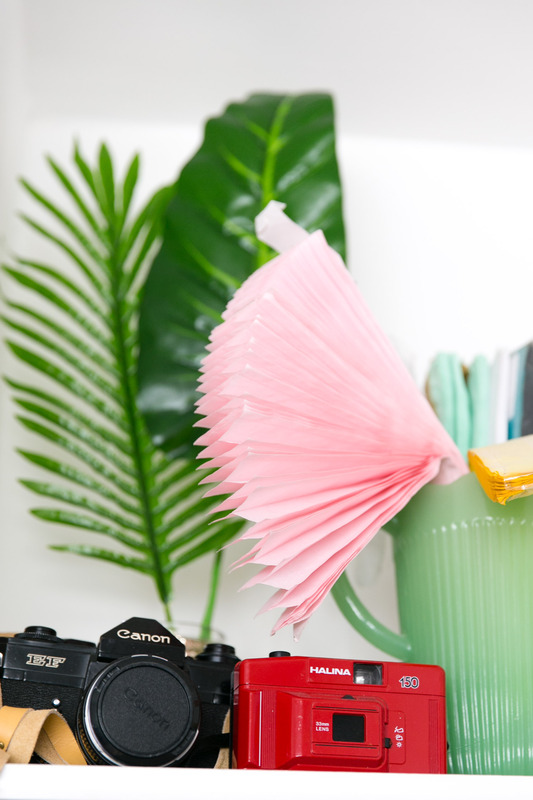 It’s filled with cards, stationery, wrapping paper and packaging and makes for a handy second desk for visitors or children. On top there is a riot of green which I love seeing as I come in and out of the room. 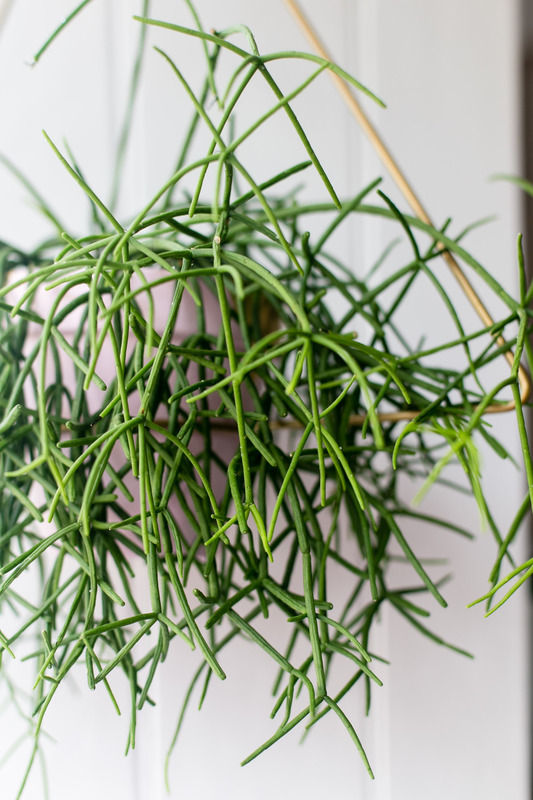 The maiden hair fern’s leaves echo the crackled glaze of the pot, the ric rac cactus is such a beautiful shape and in between the knitted cacti and ornaments peeking out bring this corner together. The picture hanging over the bureau is a pastel by Cath Read. The view is from the cliff at Beer overlooking the allotments and beach. It is so vibrantly captured and takes me back to standing there and kissing my husband for the first time on a hot August day way back when. In the corner I have more camera equipment storage, the ceramic hat stand cost me £1 from a car boot sale and given the number of repairs you can see I probably overpaid! Inside you’ll find light stands, tripods and backdrop stands, it keeps them out of the way but always on hand. Hanging next to it you see my Capture by Lucy vinyl photo backgrounds which I have held up in a couple of bulldog clips. 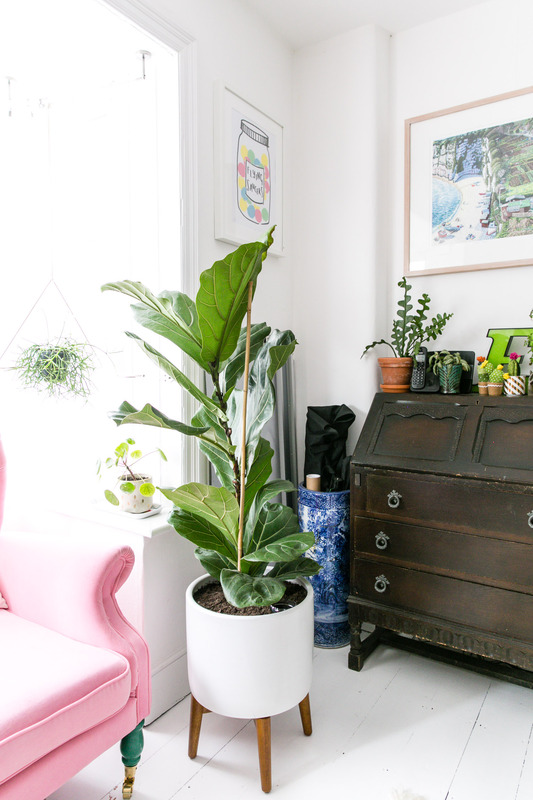 My favourite thing about this corner is the mid-century planter which is home to my fiddle leaf fig. 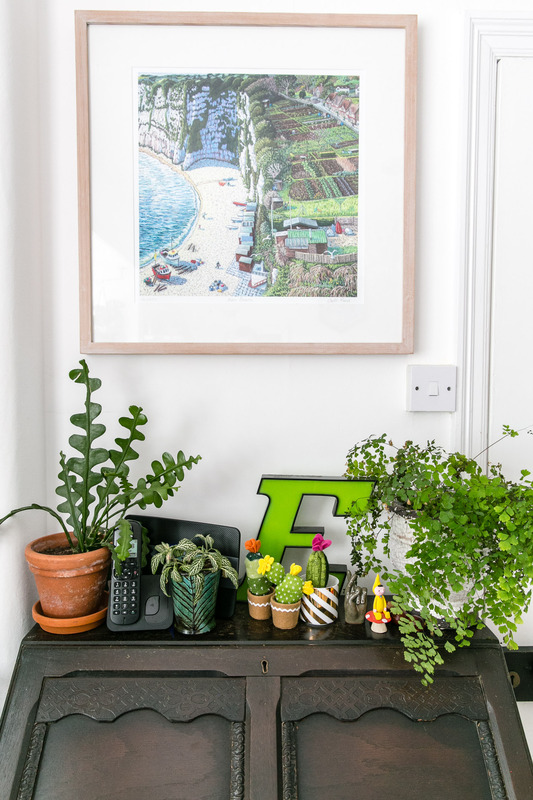 Adding in large plants is something which has given the space depth and life, it’s one of the first things people comment on when they come in or chat to me on Skype. I was keen to make sure the line of the floor wasn’t lost as I feel large pots sitting on the floor can make a space feel cluttered. 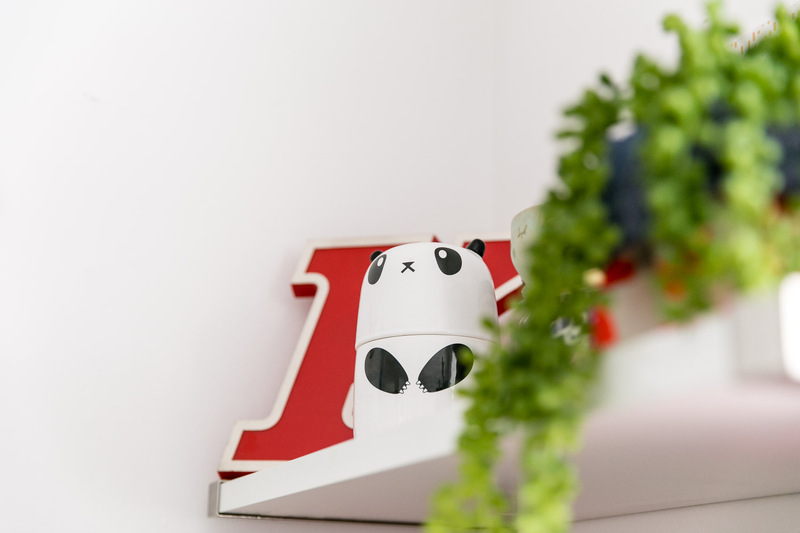 This raised planter deals with both the clutter and design elegantly, the turned legs keep it off the floor and the smooth lines of the planter itself draw your eye up. 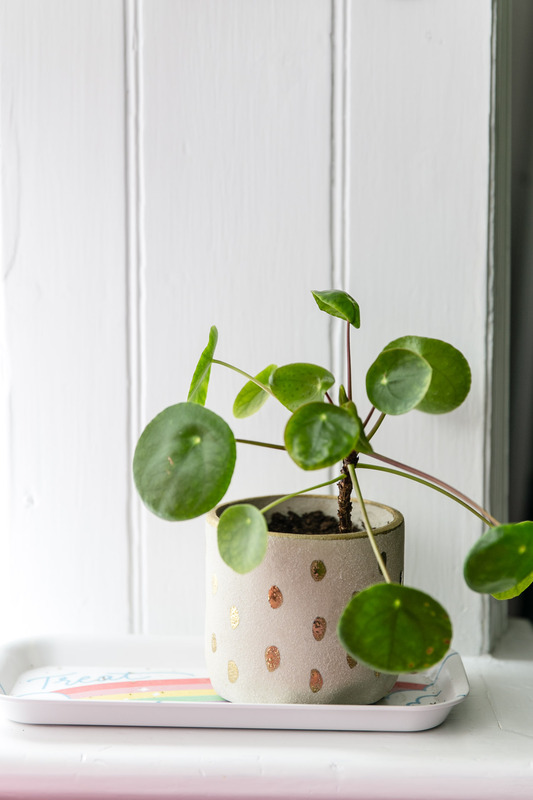 I coveted these pots every time I went into West Elm and was thrilled to have been gifted one for this room. Originally I had imagined it running parallel to my desk but turning it to run from the back wall through the middle of the room suddenly made the space look so much more inviting. The size means I have plenty of cosy rug space to walk on but still enough room around it to see the floorboards and to give it a sense of placement in the space. It’s like a woolly runway to my desk. 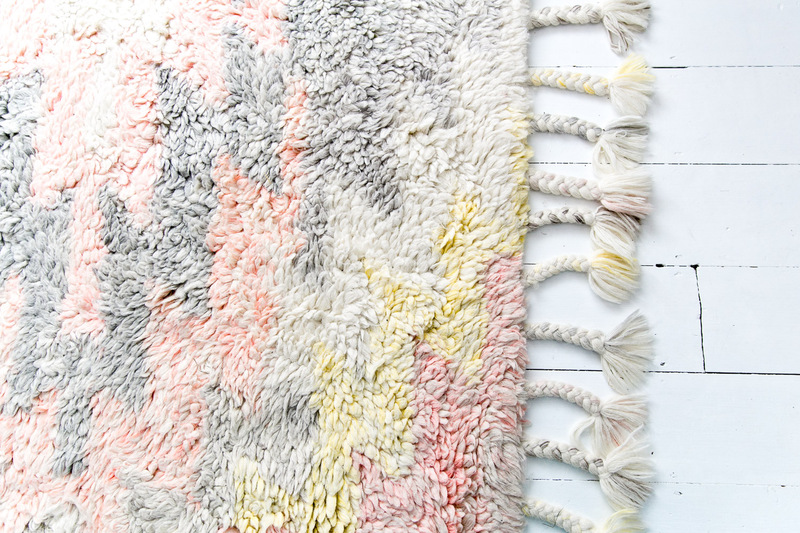 It’s a thick wool rug and in the first few months clouds of wool came off and gently scuttered around the floor. Now that it’s settled it doesn’t give off much fluff and is still luxuriously full to walk on. The feel of it is so cosy especially when it’s cold outside and there’s often a cat or a child to be found lying on it. Just looking into the room from the doorway makes me feel happy and calm. 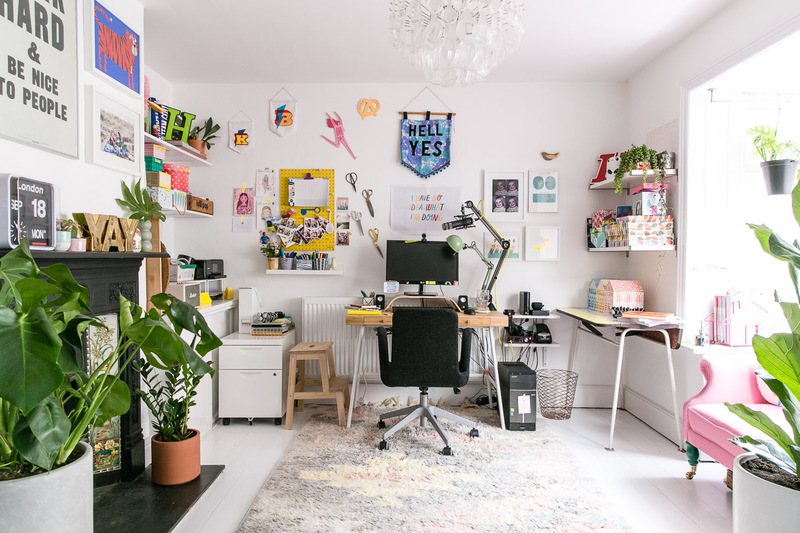 This is where I record podcasts, videos, edit photos, write, plan conferences, mentor people, chat with my online besties and do everything else in between. Creating the space was a stepped process, at each stage living in it before deciding what more to add which has meant that I didn’t make any rash purchases. Taking things slowly can feel frustrating but it pays off in the long run as I now feel like this room is well lived in rather than put together like a set and it will continue to evolve. While there is a lot of colour in here it’s tempered by the black, white and grey elements and the larger spots of colour stick largely to a pink and yellow scheme with lots of leafy green. Yes, I do pinch myself that I am able to have this space in my home, that I get to come to work here everyday and dream up ways to make the world a better place. 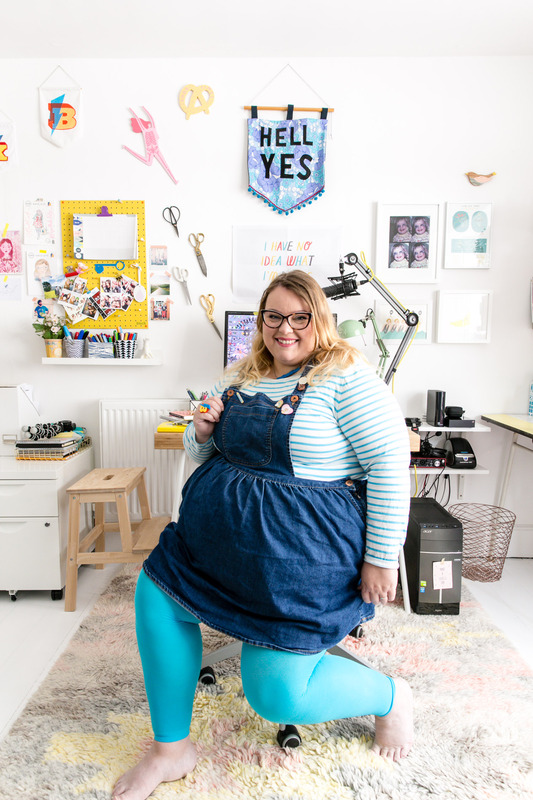 I hope you have enjoyed a peek into my workspace, if you have any questions about anything I haven’t linked to below please get in touch and I’ll happily answer any questions. Some of the links here are affiliate links which means if you purchase after clicking them I’m paid a referral fee. I really appreciate everyone who uses my links to shop, thank you for choosing to support me. If there is something you like that isn’t listed please do comment and I’ll add it on. Oh my goodness Kat, I love this space. That pink sofa is delicious and the plants, and that gorgeous fireplace. I wouldn’t ever leave this room if it was in my house! 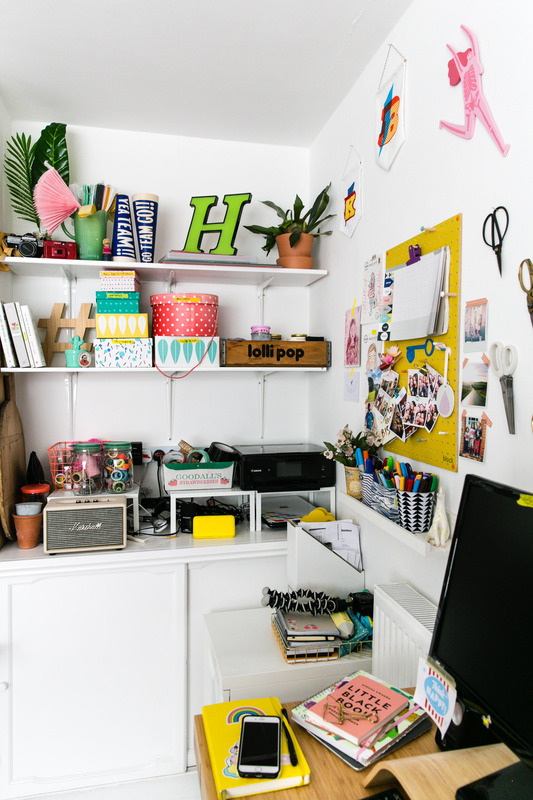 Oh my, your workspace is just WOW!!! From the colours to the lighting and the arrangements, everything is so personal and perfect!! !